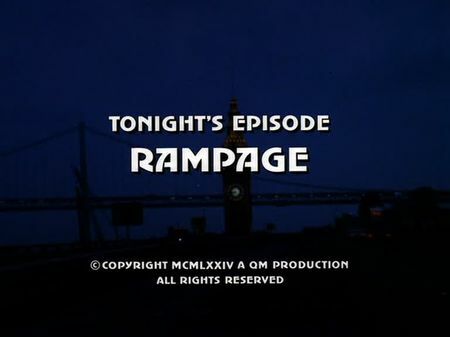 I have just added the screencaps for Rampage to the episodes' page. A shady night bar is smashed by a group of masked men. Following the attack, one of the guests is found knifed. Mike and Steve team up with Lt. Perez of the narcotics department since the killed man was a narcotics informer. It soon turns out that a group of four vigilant residents is responsible for smashing local bars and night clubs, trying to clean up their neighbourhood in order to have a safer place for their children to live in - and a stake-out photo at the narcotics office indicates that one of them is also a legitimate suspect for the murder: Joe Joplin - an old friend of Steve. Following another rumble in a local night club, police can bust one of the culprits who - in the face of the penalty - finally admits his guilt. Meanwhile, Joe Joplin is on the trail of a junkie who threatened his wife - luckily, Mike and Steve can stop him from cutting a caper. However, the junkie provides a decisive hint, so police concentrates on the murder and on a drug dealer who was also involved in the threatening of Joe Joplin's wife - Flloyd Stahlbecker. A cosignment is about to arrive, and Stahlbecker has to pick it up. This episode is a real locations hopper. Joe Joplin's and his neighbour's houses are located on 37th Ave, next to the southern part of Sunset Boulevard. Their targets, the 'Parkside' bar as well as the 'Glamour Girls' night club, however, are actually located in the eastern Parkside, on Taraval Street between 19th and 20th Avenue. Steve picks up Mike at his house on Potrero Hill, and Flloyd Stahlbecker receives instructions on the next drug cosignment in the Sutro Heights Park (Warburton and Stahlbecker exit the park at the 'Lions Entrance' next to the Point Lobos Ave and 48th Ave intersection). Police stake-out takes place at Portola Drive and Evelyn Way (the Joplins leave Miraloma Market at 755 Portola Drive, which is still existing), and later on Corby Joplin is threatened by Stahlbecker and Turgan after leaving Portola Pharmacy at 737 Portola Drive. A huge jump was made to the location where Joplin chases Turgan which was filmed in the Richmond district at Clement St and 9th Ave, whereas the drug consignment arrives at Pier 41. The final chase leads us downtown to the Montgomery Street BART Station, exit Sansome/Sutter Streets. In the epilogue, Mike and Steve meet the Joplin family again on Taraval St between 19th and 20th Avenue.